Prosecutors at The Hague war crimes tribunal say they expect the extradition of the former Bosnian Serb leader Radovan Karadzic to be delayed. Mr Karadzic's lawyer has made it clear he will appeal against the extradition at the very last minute on Friday. However Serbian war crimes prosecutors say they expect Mr Karadzic to be sent to The Hague next week. Mr Karadzic plans to conduct his own defence in his trial - something the tribunal prosecutors oppose. Mr Karadzic was captured on Monday after more than a decade in hiding. He is being held in Belgrade pending his extradition to the United Nations' International Criminal Tribunal for the former Yugoslavia in The Hague. His lawyer, Sveta Vujacic, says he will appeal against the extradition - but not until just before Friday's deadline, and that the document will be posted instead of being hand delivered. Correspondents say this is a delaying tactic, and that as it is almost inevitable that Mr Karadzic will be extradited to The Hague his lawyer appears to be just playing for time. There is speculation that, like the former Yugoslav President Slobodan Milosevic, Mr Karadzic intends to drag proceedings out for as long as possible - possibly until 2010, when the court's United Nations mandate runs out. Experts say, however, that prosecutions are likely to continue past that date. Mr Vujacic also says Mr Karadzic has had a shave and cut the long mane of hair that had helped disguise him during his 13 years on the run. "He's looking good," Mr Vujacic told AFP news agency. "He now looks just like before." The BBC's Mike Wooldridge in The Hague says Mr Karadzic could be asked to respond to the 11 charges against him within days of his arrival. If he is found guilty he would, like others who have been imprisoned by the tribunal, serve his sentence in one of the 20 or so countries that have agreed to take those convicted for war crimes carried out in the conflicts in former Yugoslavia. Mr Karadzic, 63, declared independence for Bosnian Serbs in 1991, sparking the 1992-1995 Bosnian war. 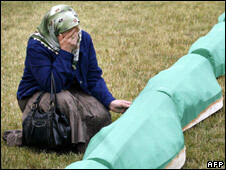 He has been indicted for crimes against humanity and genocide over the massacre of up to 8,000 mainly-Muslim Bosniaks at Srebrenica in 1995. He has also been charged over the shelling of Sarajevo, and the use of 284 UN peacekeepers as human shields in May and June 1995. Mr Karadzic has denied the charges and refused to recognise the legitimacy of the UN tribunal. He was a close ally of former Yugoslav President Slobodan Milosevic, who was himself extradited to The Hague tribunal in 2001, but died in 2006, shortly before a verdict was due to be delivered. Mr Karadizic went into hiding in the years after the war, but was discovered to be posing as a doctor of alternative medicine in Belgrade. He was arrested on a bus in a suburb of Serbia's capital on Monday. More details have emerged of his life on the run practising alternative medicine under the name of Dragan Dabic. Masquerading as an expert in human quantum energy, the fugitive was so confident in his disguise he even had his own website, and would give out business cards during alternative medicine lectures. His card gave his name as D D David, D D apparently standing for his pseudonym Dragan Dabic. 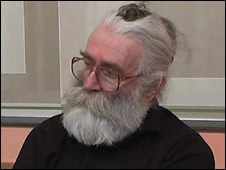 Under his alias, Mr Karadzic gave lectures comparing meditation and silent techniques practised by Orthodox monks. He spoke in Belgrade in May, and also in the town of Smederevo, east of the capital. Serbian intelligence officers were on the trail of Mr Karadzic's wartime commander, Ratko Mladic, when they stumbled upon Mr Karadzic, said the office of Serbia's war-crimes prosecutor. Serbia has been urged to follow up the arrest of Mr Karadzic by quickly catching Gen Mladic. The arrest of Mr Karadzic and other war crimes suspects is one of the main conditions of Serbian progress towards joining the EU. A new European-leaning government took office in Serbia earlier this month.